This image shows the Hubble Space Telescope's view of Supernova UDS10Wil more than 10 billion years ago. Astronomers have spotted the most distant massive star explosion of its kind, a supernova that could help scientists better understand the nature of the universe. Using the Hubble Space Telescope, scientists recently caught sight of Supernova UDS10Wil (nicknamed SN Wilson) which exploded more than 10 billion years ago. It took more than 10 billion years for the light of this violent star explosion to reach Earth. SN Wilson is known as a Type Ia supernova — a particular kind of star explosion that gives scientists a sense of how the universe has expanded over time. SN Wilson is only four percent more distant than the last most distant supernova of its kind found by Hubble, NASA officials said in a statement. However, that is still 350 million years further back in time than any other previously found star explosion. By understanding when massive stars began exploding, scientists can get a sense of how quickly the universe was seeded with the elements needed to create planets and other cosmic bodies. "If supernovae were popcorn, the question is how long before they start popping?" Adam Riess, an astronomer at the Space Telescope Science Institute in Baltimore, Md., said in a statement. "You may have different theories about what is going on in the kernel. If you see when the first kernels popped and how often they popped, it tells you something important about the process of popping corn." This work also might contribute to other work being done on what triggers these massive explosions, a question that has plagued astronomers since the discovery of Type Ia supernovas. 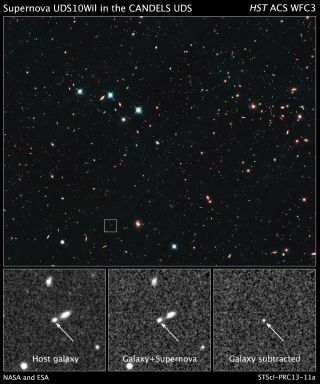 This discovery is also part of a three-year-initiative by the Hubble program to find the most distant supernovas. Scientists with the program hope to understand if the star explosions have changed in some way since the Big Bang birthed the universe 13.8 billion years ago. The Hubble Space Telescope was launched in 1990. It is expected to continue functioning for the next five years or so, and its successor, the James Webb Space Telescope, is scheduled for launch in 2018. The new findings will be published in an upcoming issue of "The Astrophysical Journal."